You certainly can’t get a good interest rate at your bank these days, but Diamond Select Toys (DST) is making sure that you can keep your money in a place of great interest. Namely their soon to be released Universal Monsters Bust Banks. It’s already been a month since I reported on DST’s varied series of licensed Universal Monsters collectibles displayed at Toy Fair 2012. You can read that entry here. 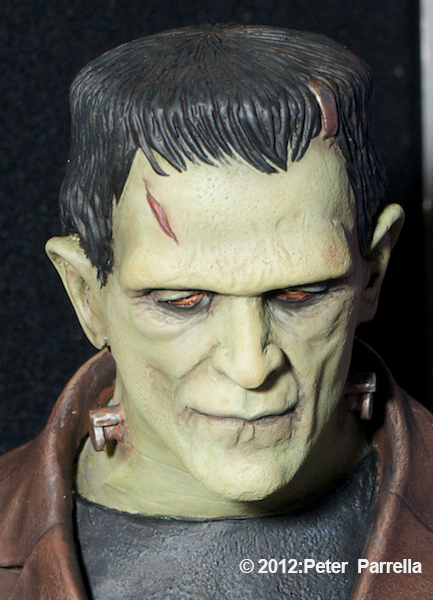 I relished the chance to ogle and photograph the very cool looking Frankenstein Bust Bank prototype, it’s a lean mean Karloffian depiction. 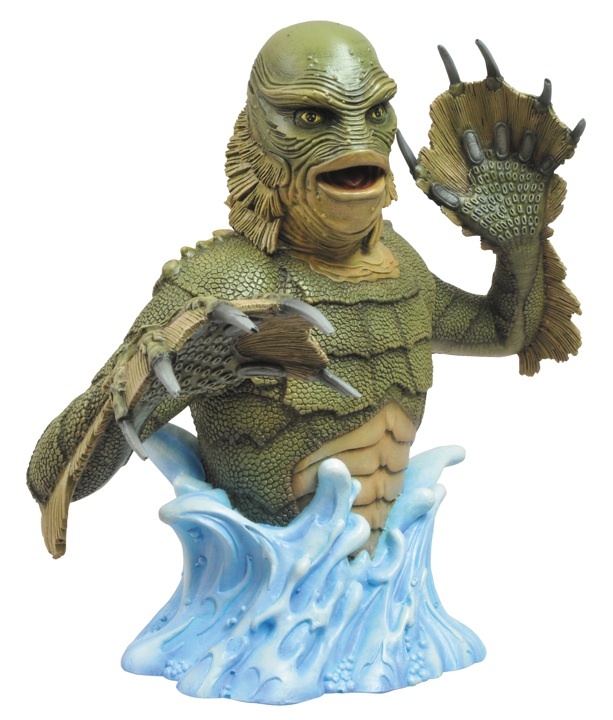 Unfortunately its counterpart, The Creature From the Black Lagoon, was not available for display. I’m a big fan of the Gill-Man and that one missing piece has kept me in suspense. Well, the wait is over as DST released this image today. It’s quite a beautiful sculpt and paint job, and I like the unique artistic flair portraying him emerging from the depths. DST’s press release says you can slide your coinage into a slot behind his gills. The Bust Banks will measure approximately 8 inches tall, are listed at a SRP of $19.99, and should be available in mid-September 2012. These will make perfect Halloween presents for “monsterkids” of every age. Imagine trick or treating for UNICEF carrying around one of these puppies. Who could resist donating. They’ll be too frightened not to. I am sorry but trying to save money is a scary enough proposition without these sinister beings shooing me off…….Talk about something to convince you spending is a nice idea LOLOL.